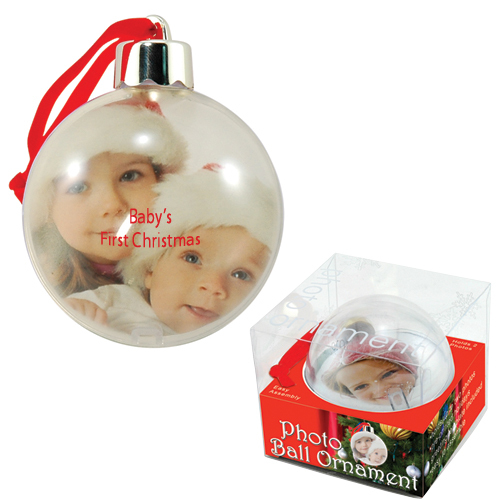 Hand Blown Glass Ornament A perfect way to display your message for years to come. Comes in 5 different colors. Individually Gift Boxed. 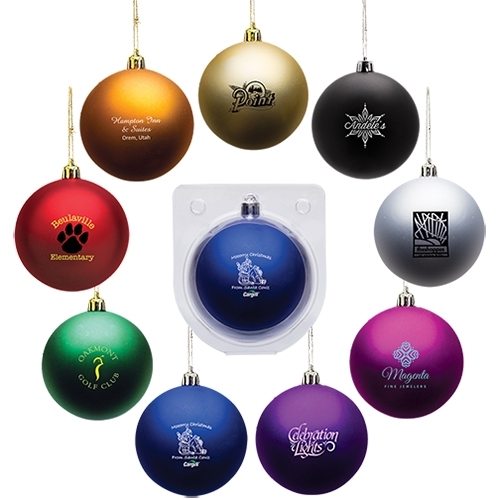 Economically priced, satin finished, durable, shatterproof ornaments are treasured mementos that will carry your message for years to come. 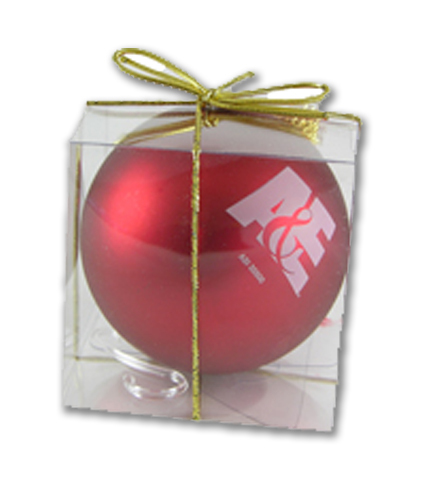 Each ornament comes individually packaged in a stock happy holidays gift box. Choose from eight beautiful colors. Our 6 sq. 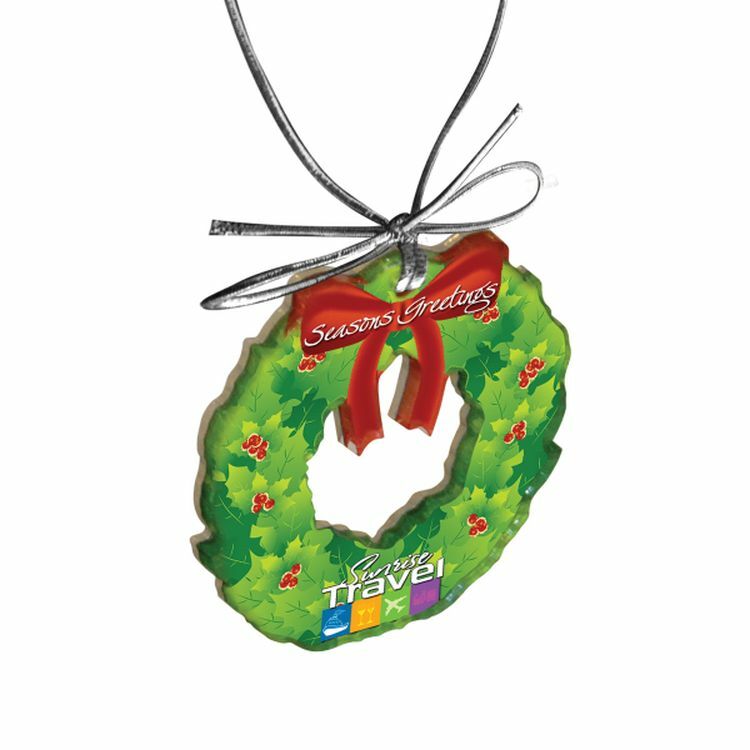 inch ornaments are crafted out of a 1/8" thick sheet of clear acrylic layered over a full color print of your graphic. Each piece is backed with a 1/16" sheet of mirrored acrylic and come assembled, creating a fitting holiday gift for your valued customers. Double-sided graphic available with an additional setup charge. Sizes shown are in square inches. All of our products are proudly made in the USA. Contact us about free samples! Our 4 sq. 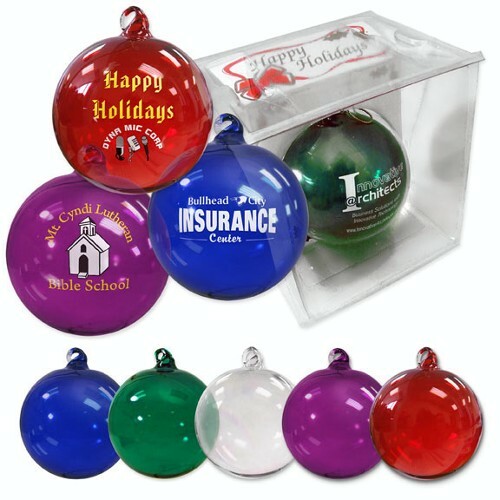 inch ornaments are crafted out of a 1/8" thick sheet of clear acrylic layered over a full color print of your graphic. 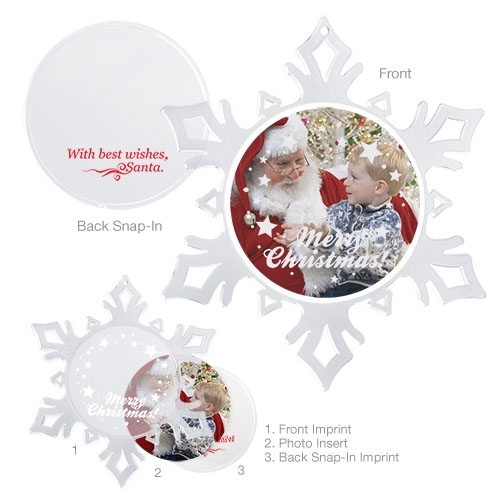 Each piece is backed with a 1/16" sheet of mirrored acrylic and come assembled, creating a fitting holiday gift for your valued customers. Double-sided graphic available with an additional setup charge. Sizes shown are in square inches. All of our products are proudly made in the USA. Contact us about free samples! 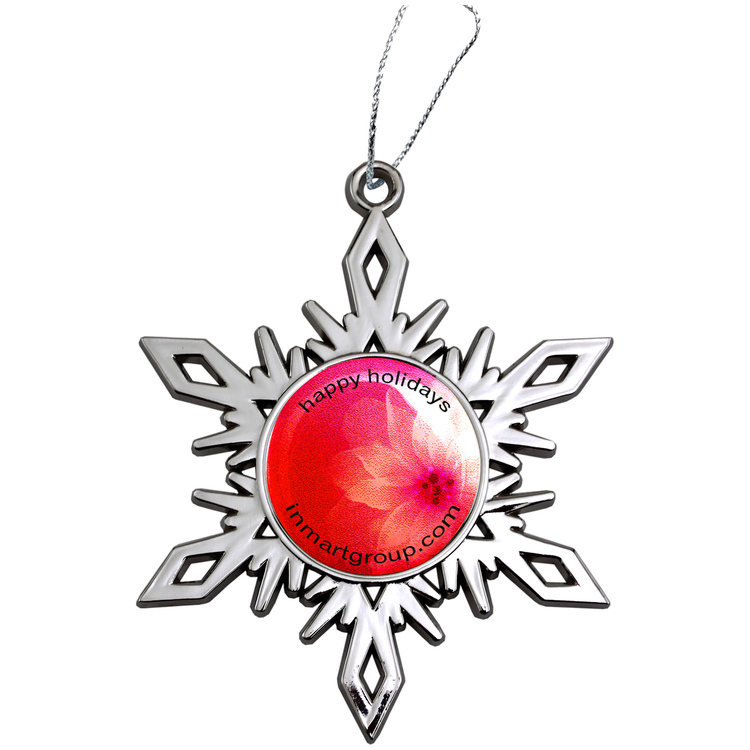 Snowflake ornament with full color imprint in center and epoxy dome. 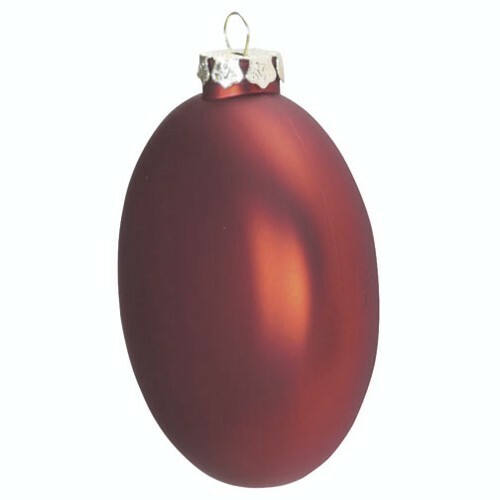 Ornament is cast in solid metal with hand satin antique pewter finish. Imprint is four color process. Comes with silver cord attachment and is individually polybagged. • Use for special events, fundraising, holiday parties and moral! - Use For Special Events, Fundraising, Holiday Parties and More! Economical way to make a "BIG" statement! 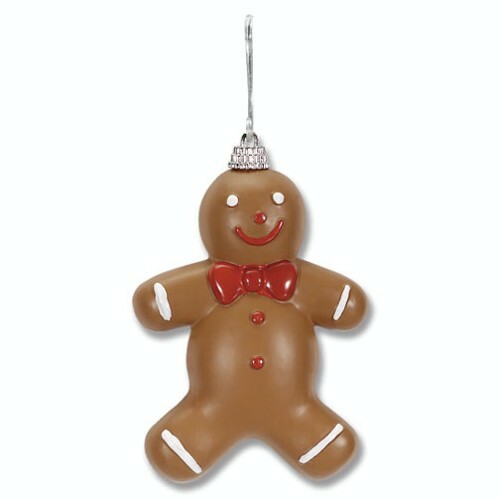 Comes packaged in clear presentation box with ornament hanger and decorative cord. - Use for parties, recognition, churches, leave behinds, mailings, and more! 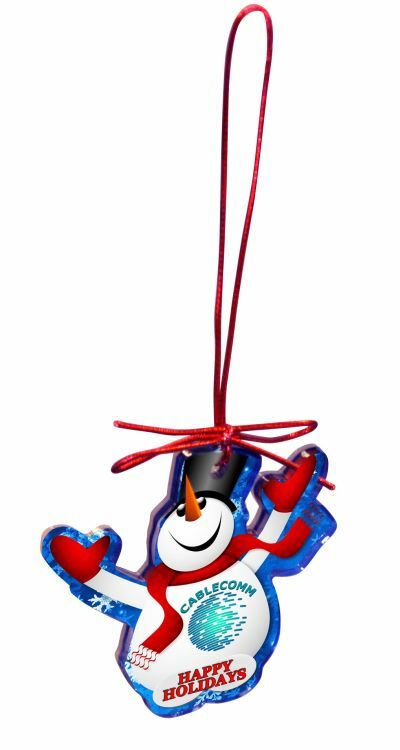 Die cast holiday Christmas tree ornament with vibrant glitter enamel color. 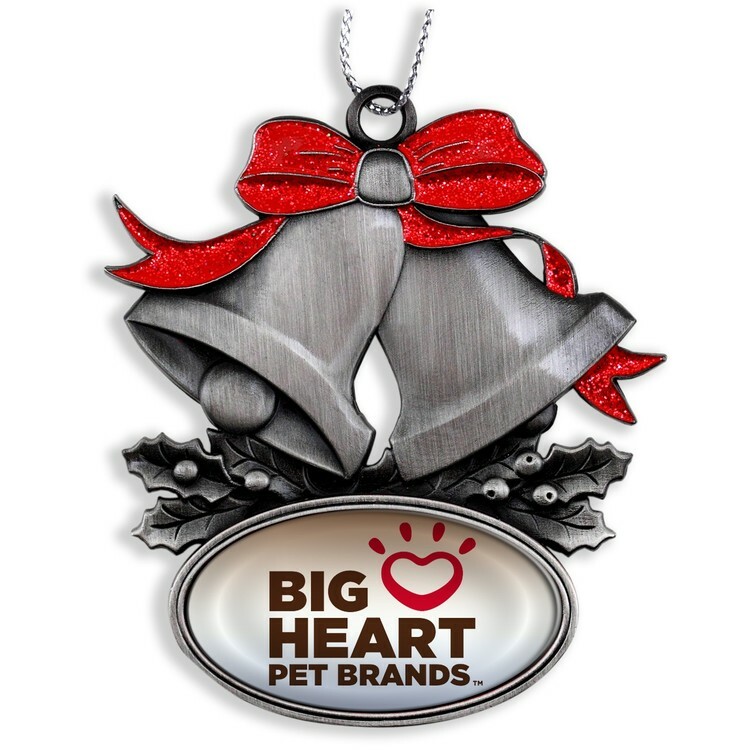 Ornaments feature: * Dimensional holiday bells shape with holly and ribbon * Antique silver finish with sparkly red glitter enamel color fill. 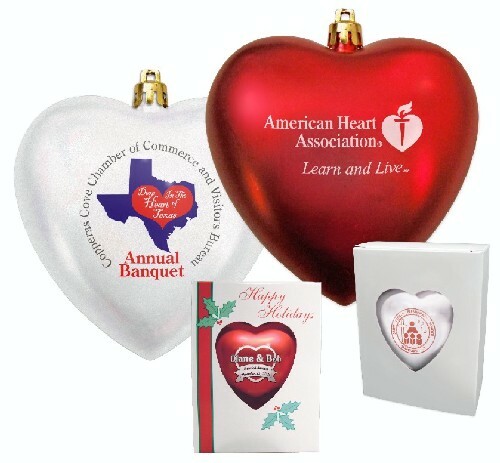 * Includes full color stock shape imprint with epoxy dome. 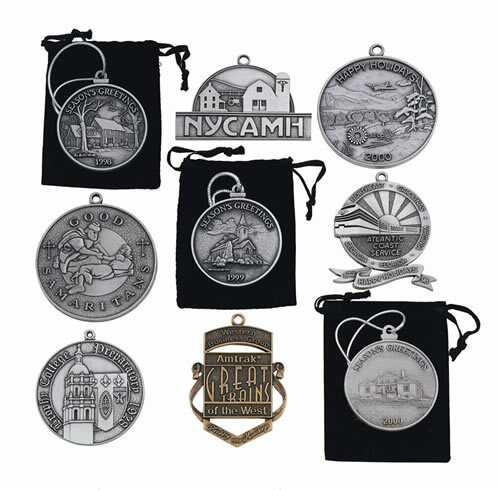 * Custom imprint size: 1-1/2" w x 3/4" h oval. * Silver metallic hanging cord. * Fast 6 working day production * Other stock shapes available. 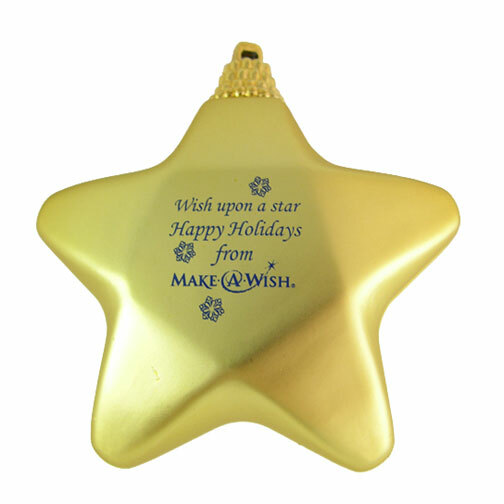 The perfect promotional giveaway for Christmas, Hanukah and other holidays. Die cast holiday ornament with winter white finish. 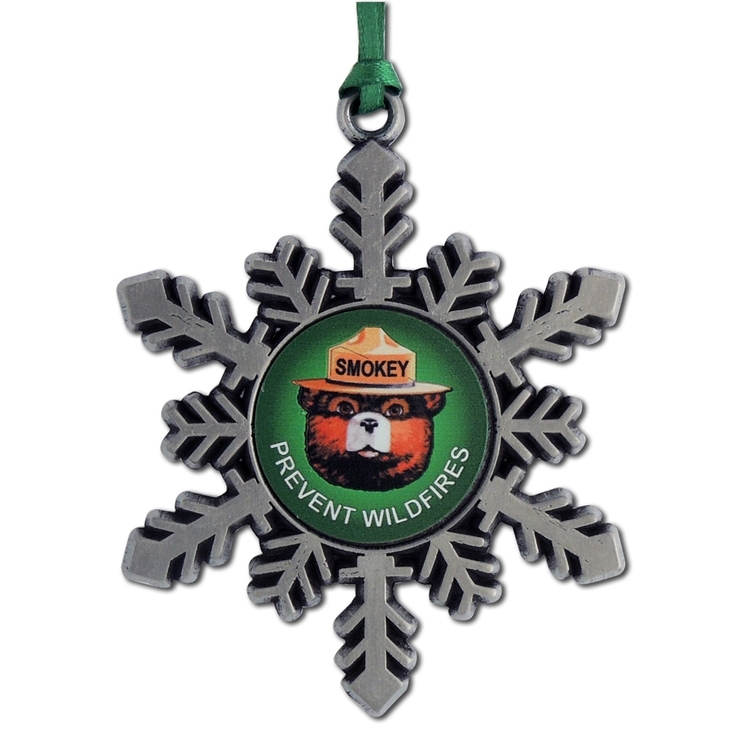 Ornaments feature: * Intricate snowflake shape with multiple cutouts in design. 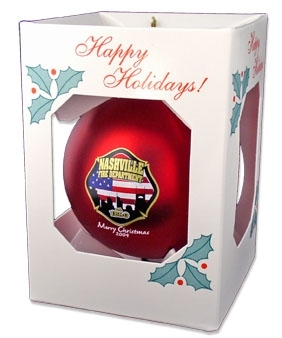 * Includes full color imprint with epoxy dome. * Imprint size: 1" round. * Silver metallic hanging cord. * Includes decorative gift envelope packaging. * Fast 6 working day production standard. Rush service available. * Bright nickel snowflakes also available. 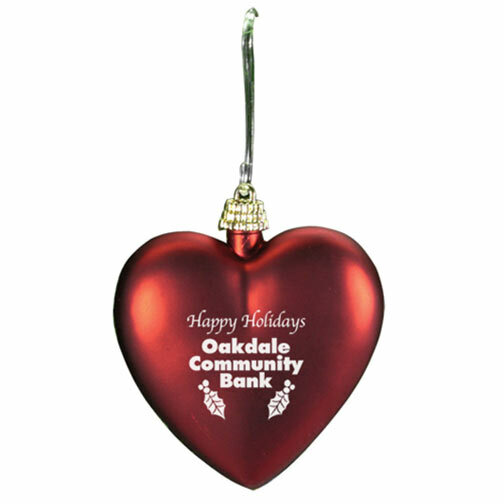 The perfect promotional giveaway for Christmas, Hanukah and other holidays. 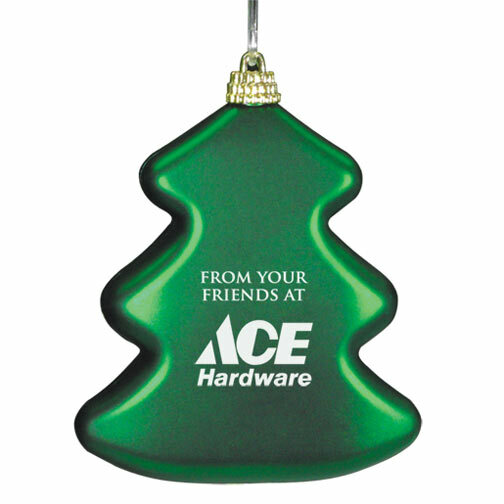 Die cast holiday ornament with bright nickel finish. 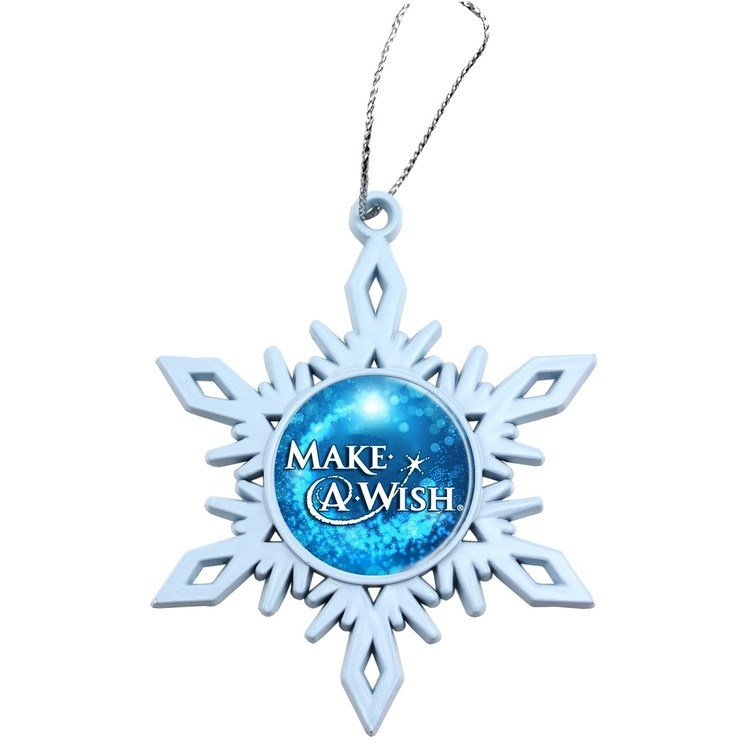 Bright white finish snowflakes also available. 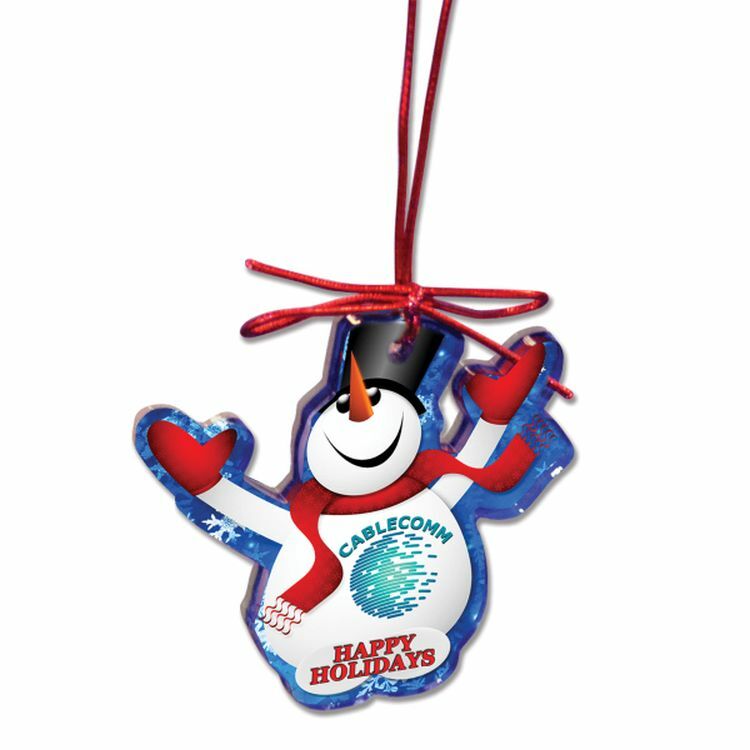 The perfect promotional giveaway for Christmas, Hanukah and other holidays. "Eco" and economical seeded paper ornaments. - Your full color message imprinted on elegant vellum paper and attached to one of six holiday shapes with natural raffia tie attachment. 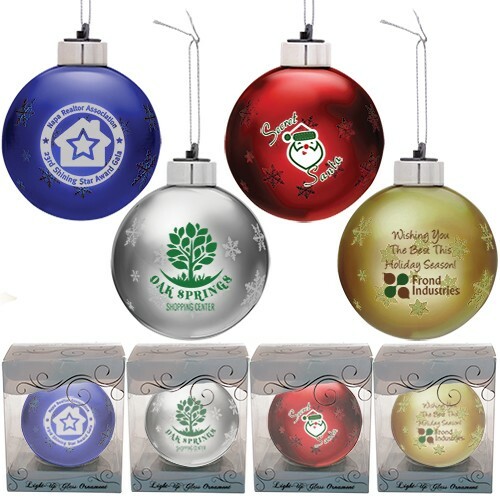 - Choose from 13 different colors of seeded paper to customize your ornament. 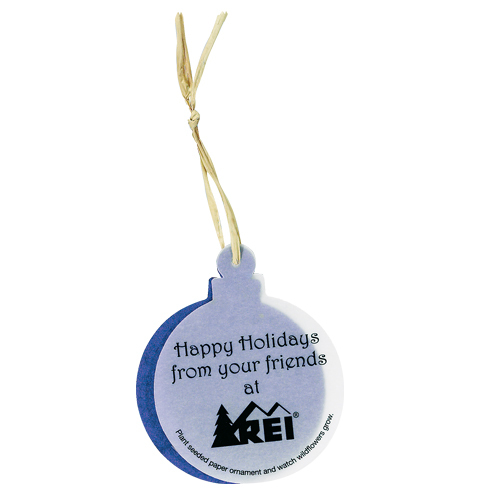 - Perfect item for a direct mail piece or to include with your holiday card.